It´s March 1st and I have to apologise for a delay as February was the month to blog about local food adventures. The excuse is my full involvement in conference preparation for a Tourism Marketing Office of North Iceland, which brought some very nice discussions and I will share some interesting outcomes here as soon as the evaluation process is finished. But now, back to a promised virtual journey full of great local food in Eyjafjordur. I want to start with introducing a new concept that started last year and is about mapping possibilities of tasting local food directly from farms where it´s being made, grown, processed, you name it. Once you click here, you will get to a map of Iceland, showing places where it´s possible to visit a farm directly and get fresh products right at the spot. Unfortunately, the web-page is in Icelandic only but I will help you navigate here. this farm has been processing feathers and making eider-downs - eventhough this is not food, it might be interesting for some of you to visit the place and just see how they do it. They also have home-grown potatoes for sale. these guys have home-made ice-cream and the flavours they offer range from traditional taste all the way to beer ice-cream. It´s a must to try, I´d say. South of Akureyri, you have the chance to visit a cow´s farm where they serve fresh dried beef and a wide range of beef yammies that one might think of. Now, there´s definitely more to add on the map as I know a few more tips from the fjord that I´ll share with you here. EKTA FISKUR in Hauganes - Professsionals in making great food out of fresh fish. They also sell all kinds of fish and their specialty for tourists is so called GOLDEN BOX with salted fish - BACALAO - perfectly packed present to be taken home. KALDI in Árskogssandur belongs to one of the best local beers in Iceland. It´s one and only non-pasterized beer and you´re welcome to pop in for tasting anytime. (might be wise to call beforehand in the summer as they´re getting overbooked then). Last but not least, there is a newly opened restaurant in Siglufjordur called Hannes Boy - a charming place with excellent food. Another must, although I have to admit that I was rather disappointed, finding it close in February without any sign saying why or when they´d open next :(. Akureyri, as a metropolis of North, has quite some places on offer and I recommend you to check their pages to find exactly something that would fit your taste and preference. My personal favourite one is a lovely café called 'the blue mug' - I could die for the cakes their including their home-made cream. Well, that´s it for today. Should you be having troubles finding the places described above, do write to me: lenka.uhrova@gmail.com or phone me up:00354- 840 13 29, I´ll be happy to help. Otherwise, I definitely recommend having a phone number of the place you decide to visit, especially during winter time so that they can come and open for you eventhough at the time of your visit they might be busy with something else - welcome to Iceland. Eventhough February posts were meant to cover local food possiblities, I feel like sharing exciting news related to inspiring tourism operations where words like ARCTIC HELI SKIING, SKI TOURING TRIPS, ICE CLIMBING, HAUTE ROUTE OF THE TROLL´S represent every day 'bread'. The reason being that I happened to attend a presentation last week, where a founder of the company Jökull Bergmenn shared his story (including lots of great pictures and professional videos), as well as his experience and future vision of the majestic mountains of Troll Peninsula. No matter how close to skiing and skies and climbing you feel, checking out the pictures and videos is definitely worth it as they say much more than words. 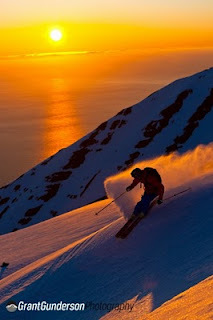 There´s a great variety of very professional service that Jökull´s company has on offer that has contributed big time to putting Troll Peninsula of Iceland on the world map of heli skiing. Funnily enough, not many locals know about what these mountains have on offer and very often it´s actually foreigners who have been using the full potential of it rather than locals. Nevertheless, there´s a growing trend of hiking in the summer and the vision is that not only foreigners but also locals will be able to appreciate and even take most out of what this powerful Alp-like range here has on offer, all year round. There´s a big challenge of finding ways that will support local kids and youngsters stay connected to nature and even make most out if it through fun activities that are enriching. I see a great potential in that and am looking forward to working in that direction alongside people like Jökull.